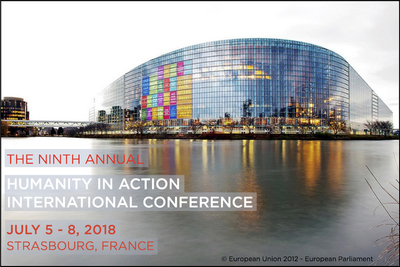 The Ninth Annual Humanity in Action International Conference will take place from July 5 - 8, 2018, in Strasbourg, France. The 2018 International Conference will focus on the European Union as the largest global peace project and one of the primary mechanisms for economic, political, cultural cooperation and advancement of fundamental rights in Europe. More than 250 Fellows, Senior Fellows, board members, supporters and friends of the organization will convene at the European Parliament in Strasbourg to explore the complex dynamics of European identity, collective memory and remembrance, as well as political, economic and cultural collaboration. Details about conference registration will be shared in March. For more information on the conference, please contact the conference organizers at conference@humanityinaction.org. Please note that a fraudulent notice is being circulated, claiming that Humanity in Action is hosting an international conference in Texas and Dakar, Senegal. We are not planning such an event. Please do not respond to these messages or share any of your personal information with this host. Humanity in Action thanks the many individuals, foundations and partner organizations who have made the International Conference possible through their donations, patronage and volunteer support. The Ninth Annual International Conference is hosted by the European Parliament. The 2017 International Conference was held in Berlin, Germany from June 22 to June 25, 2017. The conference explored the rise in nationalist sentiment, xenophobic rhetoric and political extremism across Europe and the United States, and the resultant challenges to transatlantic relations and domestic policies on both sides of the Atlantic. The 2016 International Conference was held in Athens, Greece from June 23 to June 26, 2016. The conference explored a range of critical issues concerning Greece's economic and political situation. The 2015 International Conference was held in The Hague, The Netherlands from June 25 to June 28, 2015. The conference explored how The Hague’s approach to international justice and peace impacts national debates on human rights issues in the Netherlands and throughout the Western world. The 2014 International Conference was held in Sønderborg, Denmark from June 25 to June 27, 2014. The conference featured keynotes, workshops and discussions led by experts, activists and Humanity in Action Senior Fellows who provided Danish, German and international perspectives on the theme of borders and minority populations in border regions. The 2013 International Conference was held in Warsaw from June 27 to June 30, 2013. The conference included site visits in Warsaw that explored past and present Poland, as well as an optional visit to the Treblinka memorial site. The 2012 International Conference was held in Sarajevo from June 27 to July 1, 2012. The conference included site visits to Potočari, the memorial site for the Srebrenica massacres, to Mostar and to the frontlines of the siege of Sarajevo. The 2011 International Conference, "Towards More Just Societies: Learning from History," was held in Berlin at the Bertelsmann Foundation from June 30 to July 3, 2011. The 2010 International Conference, "Perspectives and Visions: Diversity and Human Rights," was held in Amsterdam at the Felix Meritis Foundation from June 30 to July 3, 2010.